I wanted to do this experiment for a while. I am a quite misanthropic person. I don’t like cosplay events much, and I’ve been told that for being a cosplayer, I should attend more of those, to get some contacts, customers, make public relations. The fact is that I find those events frustrating. Don’t misunderstand me, it’s perfectly fine that not everybody is willing to pay a monthly wage in a costume, or has to spend months in the study of a thing from a non existing world. But I find very frustrating when all your attention to detail, all your months of hard work are pulled apart just because someone else, who’s bought the costume from aliexpress, just looks more like the character. The point of the whole thing is the costume, to me. Making, studying, crafting. But most of those attending such events don’t even get the basic difference between bespoke and handmade, and aliexpress. 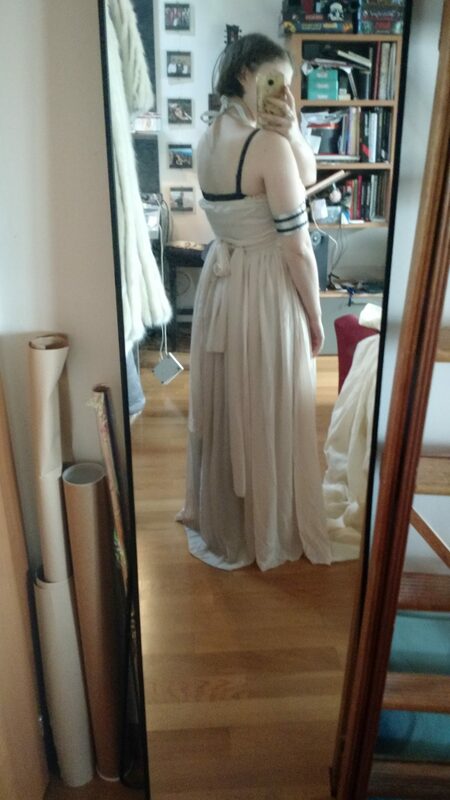 Because yes, when you’re getting something from a comic or anime, I can see that those can be helpful for your pockets, but when we talk of a huge work behind a real costume to make a replica of, a work of art such as the Game of Thrones or Star Wars costumes, you have to feel the difference, don’t you? Or is that plastic thing enough? Don’t you see the topstitching on polyester, while the original was soo smooth? But most of all, why spending some heretic amount of money on differences no one will ever notice. Well, unless of course you do it for you. 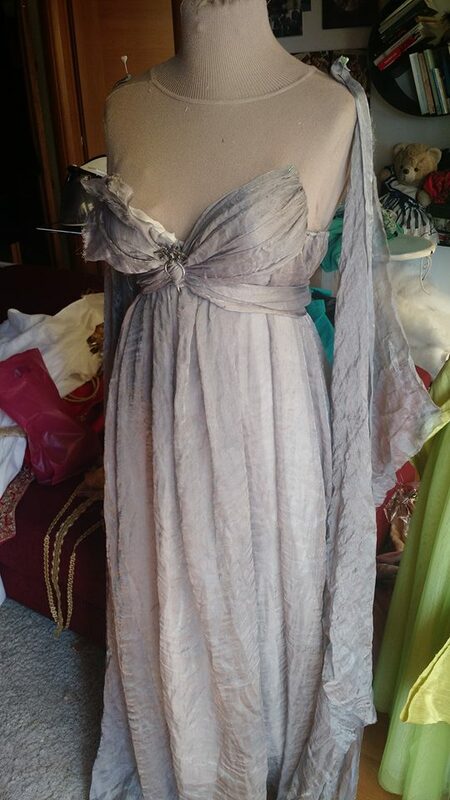 But sometimes I simply ask myself if I can’t just take one from ebay, and get the satisfaction of wearing that gown I’ve dreamt of without spending all that money and all that time for something I will wear once. 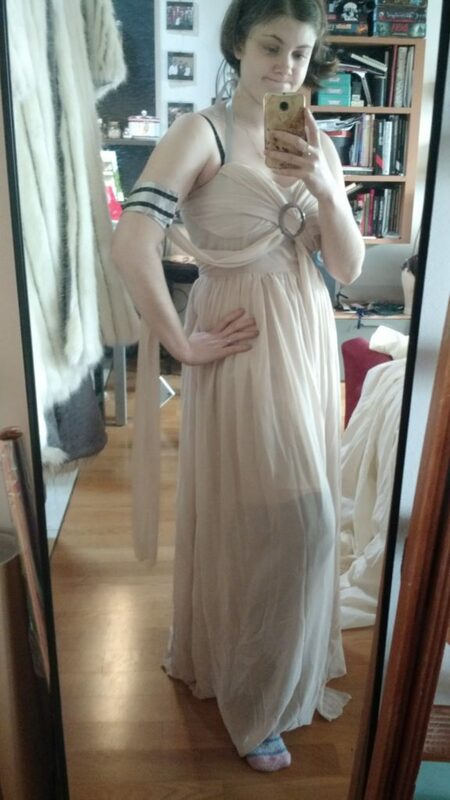 So I got on ebay, I found a dress I wanted to make for some time, and I ordered it. And this was before Lucca Comics (largest european cosplay thing) 2017, where I went with my Daenerys white fur coat, that costed me hundreds of euros, and of hours of work. That for the coat only, then there’s the chain, the wig, two different pair of boots and a pair of gloves that never arrived. And with a costume costed less than a hundred euros and the time of a click on ebay at my side, to the audience it was the very same (we were simply standing aside, no competition, no pantomime, no acting skills, just standing for a picture). 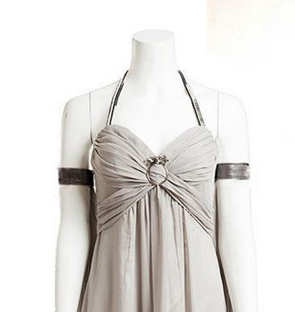 So this is the dress. 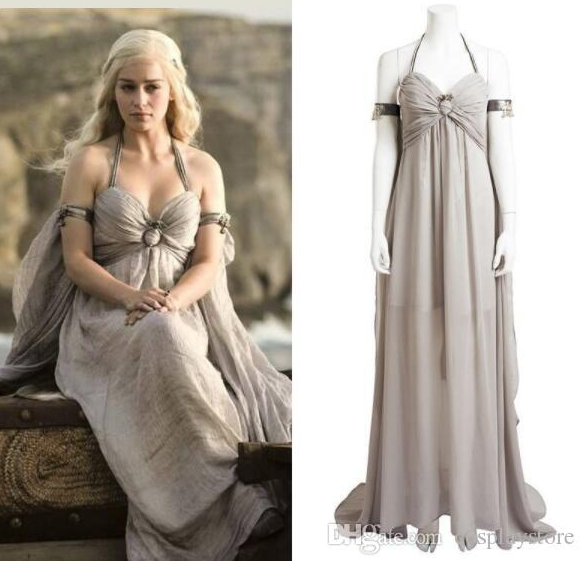 Mother-of-dragons-to-be’s wedding gown, and the one whe had at Khal Drogo’s funeral. 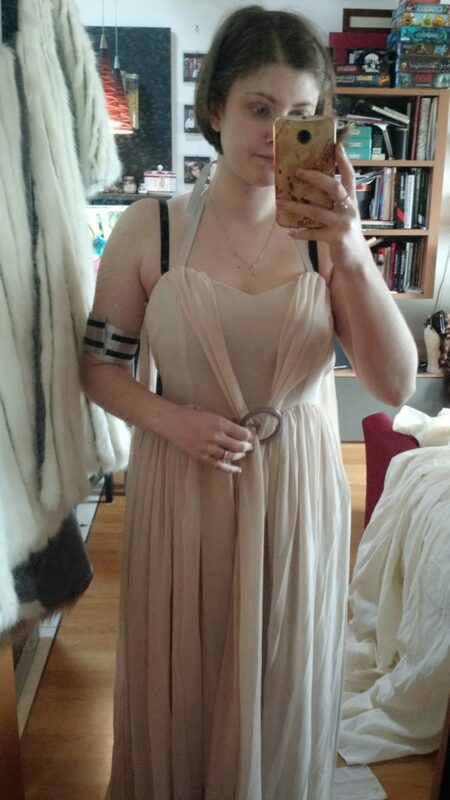 But no one ever remembers that, so no one ever wears it without armbands and with the braid. I will. Ebay: standard sizes. Cost: less than 50 euros. I chose this because it’s one of the less expensive, and one with the closest result, compared with the price. I still doubt I will get the one in the side picture, but one can hope, until he gets the package, right? Counting how much synthetic chiffon would be required for that result and what I’ve paid, I’d say I’ll get a dress with half the fabric. We will see. I have a feeling that to make it nicer, they cut the skirt part in an other way, not as the tube-like gathered one of the original thing. First row, screenshots, second rown, exhibit pics. Believe it or not, it should be the same costume. 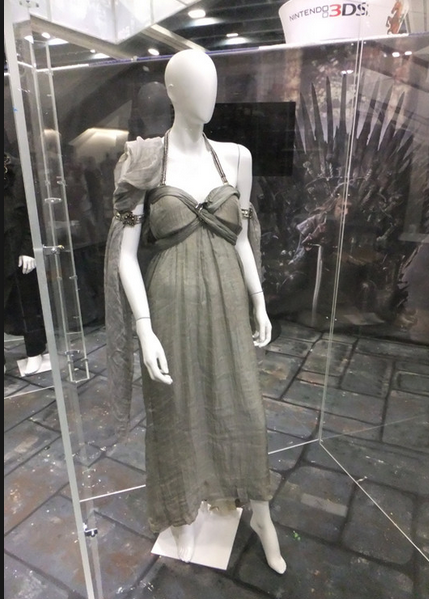 In the show the subtle effect of the fabric was not visible, in the exhibit I think someone messed up with the mannequin (too tall) and placed the dress in the wrong way. 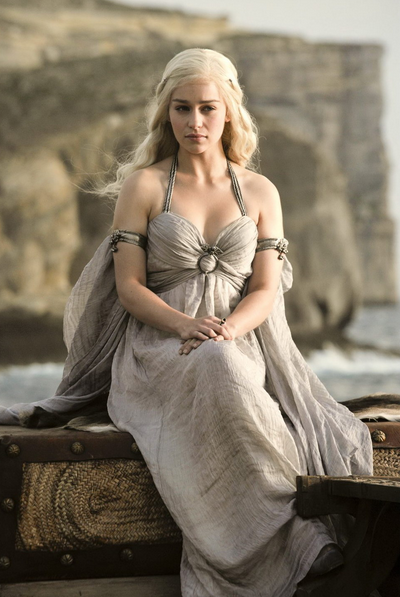 But however that’s the dress. The two gathered bands seem to be darker. 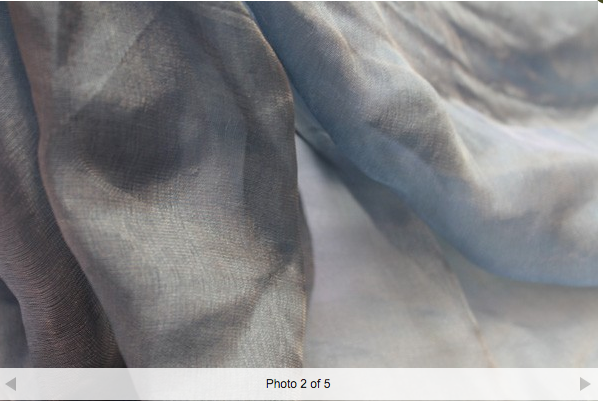 Fabric is a metallic silk chiffon, supplied by Topfabrics. It’s an extremely peculiar fabric. They assure that the blue-ish is the one they used in the show. Filters, dark magic, or whatever, the final effect on the screen was closer to an other shade they offer, but however, this thing looks like woven unicorn blood and I want some. It costs. A lot. It’s 25£ per meter, plus VAT plus shipping. Counting that you’d need at least 5 meters if you want to get it nice and rich and make the arm parts, just because you never know you may need them and have to pay twice for shipping. Let’s make 6 meters, just to avoid the risk of paying shipping again. And I live in Europe. But it’s still 35£ that I would not want to spend twice. I guess you’d need a backing fabric not to show your underwear to the world. 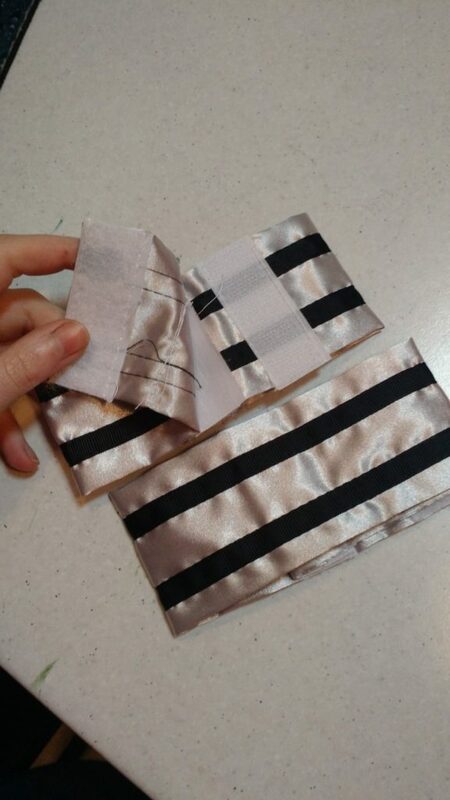 Doesn’t need to be fancy, but it does need to flow with the original fabric. So let’s say some kind of silk, and let’s say 3 meters of it. Then there’s the metal (or metallic leather as some say) braided parts. Who did them by hand swear it takes forever. There’s no ready made thing that looks like these. If the fake one is close enough, damn, I’ll re-use those! Then there’s the bells, those things that hang from the armband, that we pretend we can get close to by using some beads, or ordering the indian ones. So, to make a replica, with the closest available materials, it would cost- being optimistic- at least something like 350 euros. Just for materials and shipping them here. Ok, it doesn’t have a weird pattern like things she’s had in other episodes, so it wouldn’t require much time to make. 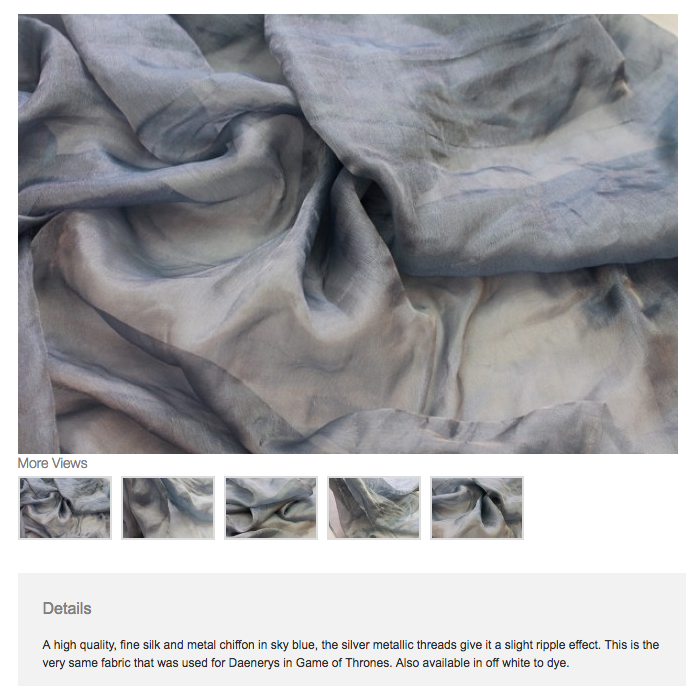 Unless you count hemming the silk chiffon by hand (because machine stitching that hem, stiffening it, after you’ve paid that much for the fabric would be blasphemy) and probably braiding by hand those armbands and neck string. 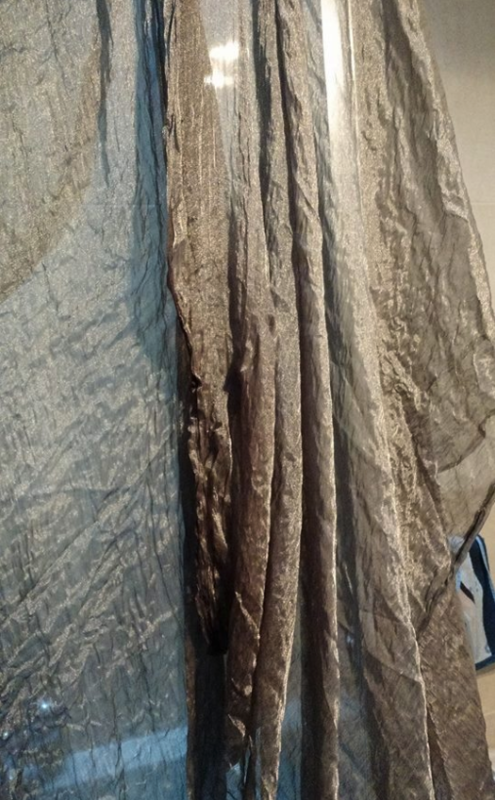 The silk fabric would need to reach the floor, and it’s extremely fragile, as it’s silk. So you’d get a very fragile dress, never to be stepped on, never to be worn with the skirt down on asphalt. So basically, after you made it, you’d wear it once, to make the pictures, on sand or marble. After so much money and time spent on the thing, it would be a real pity to be afraid of using it for the risk of tearing the fabricin the lower part of the skirt. 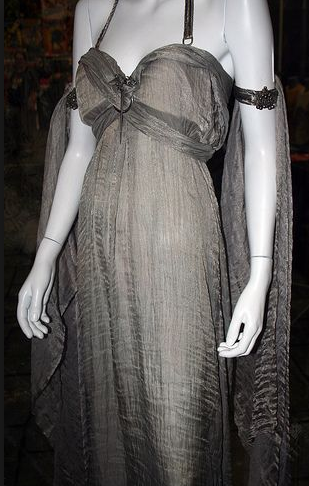 I am extremely careful about this, because it’s how I’ve had to throw away my first Padmé’s Lake Gown. 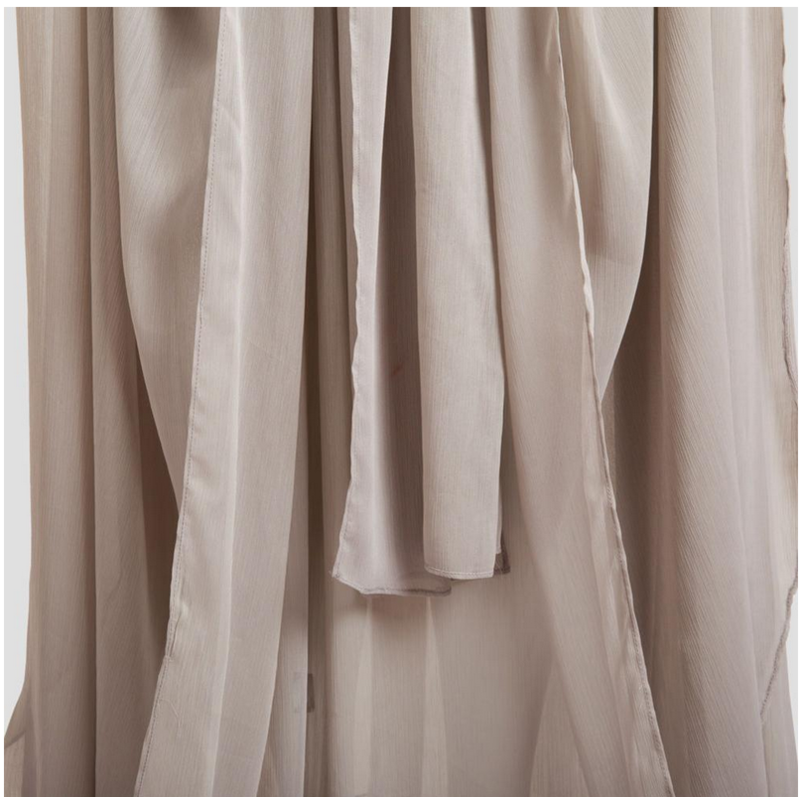 Silk chiffon with holes and tears in the part reaching the floor. 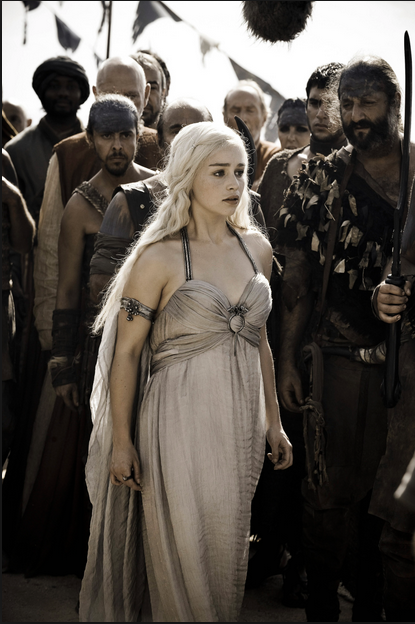 And with this costume from Daenerys it has to be as the original once you spend this much, once you get so close. you can’t show your feet and spoil the whole result because you have fear. So I wanted to try the cheap one, the not accurate one, to see if it can make me happy. One day, maybe, I’ll be able to get my hands on that amazing fabric. But what does we say to the wallet god? Not today. I have purchased the real fabric. No longer available in blue, I got t white so I can dye it. This time I will get a very accurate timetable, to know how much is the difference. I promised myself I would have waited until I got the ebay thing, but I couldn’t, I wanted to see how that spun magic looked like. 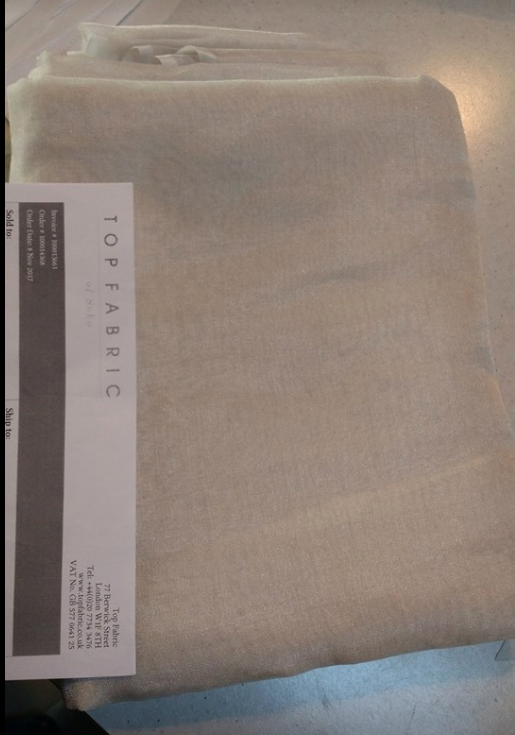 The real fabric arrived in less than 24 hours from when I placed the order. 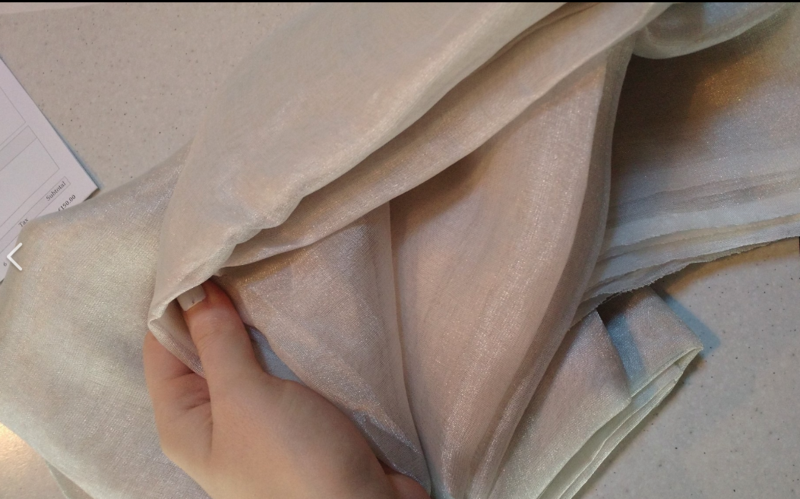 The right color one was not available in the right amount to make the whole dress, so I had to purchase the white one and dye it.The fabric really is amazing, it is silk chiffon with metal threads in it. It has a light that no gauze, nor other silk chiffon can give. It falls in a peculiar way, the metal t makes it behave very uniquely. 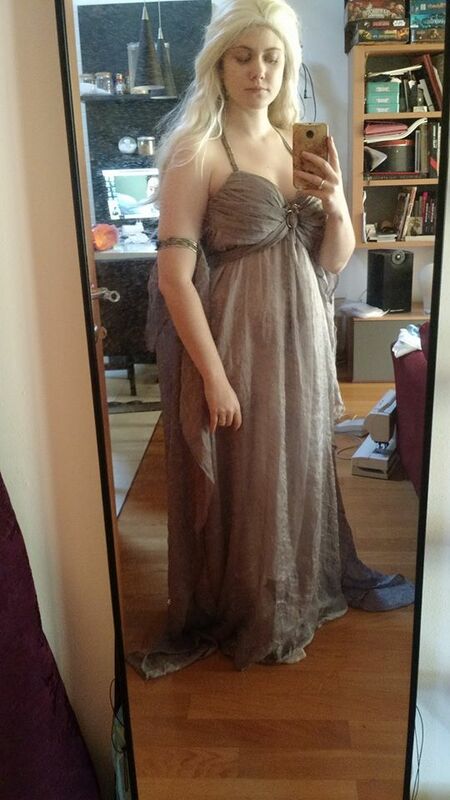 So I am super happy of the fabric itself. I had some problems in dyeing it. I wanted to make it between gray and blue, to have it a bit similar to the original one from the shop, but also similar to the one from the exhibit. 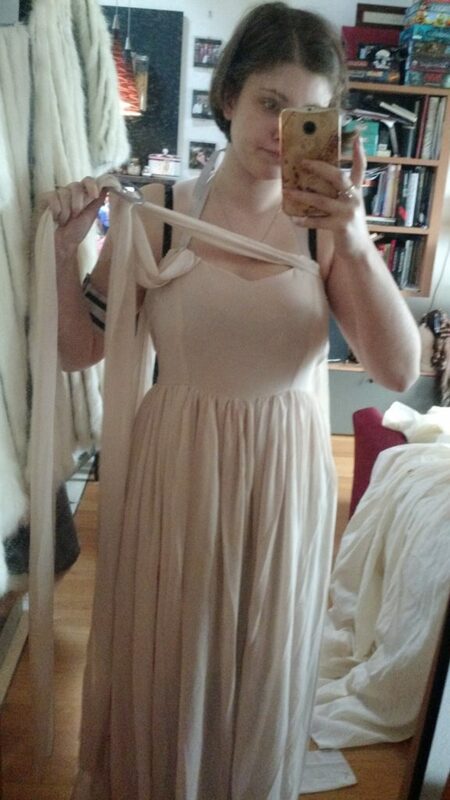 The problem is that dye reacted weirdly, and when I rinsed the fabric I got a nice salmon color. Which, for those who know color theory, is the right opposite to blue. I added a light acid to fix the color in the second dye bath, and poured all the blue I got to get it at least to gray. And it worked. It is now dark gray, too dark gray. I will cut some portions to make the darker parts (arms and bust bands) and I will attempt at de-colouring the rest. It needs some kind of backing. 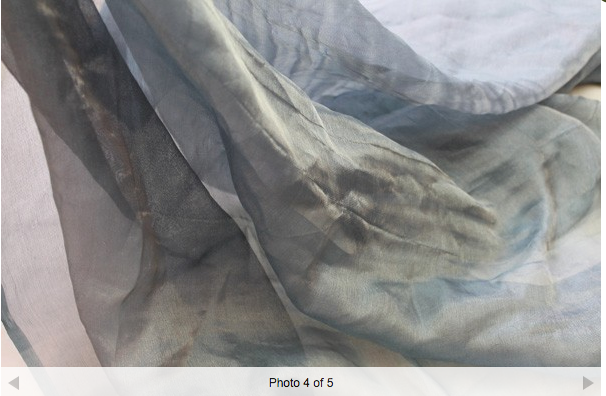 I will get some silk georgette, to be dyed the lightest gray. So we start saying 250 euros of the original fabric, plus three boxes of dye and one of de-coloring powder, it’s more or less 20 euros. Two hours for dyeing it the right color, with the salmon color problem. Probably just one, if you get it right at the first time. I need some time to think where to start from. I just opened the package, and I didn’t understood that it was the costume. 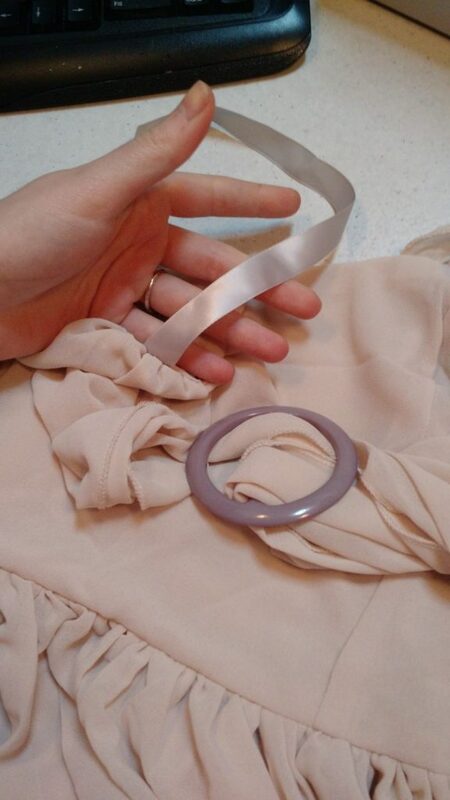 I had ordered some silk georgette fabric and I was ready to ask a return as it felt obviously synthetic, and I was wondering about why it had two weird satin and velcro bands until I extracted it from the plastic and saw the buckle. I think we need to go further. 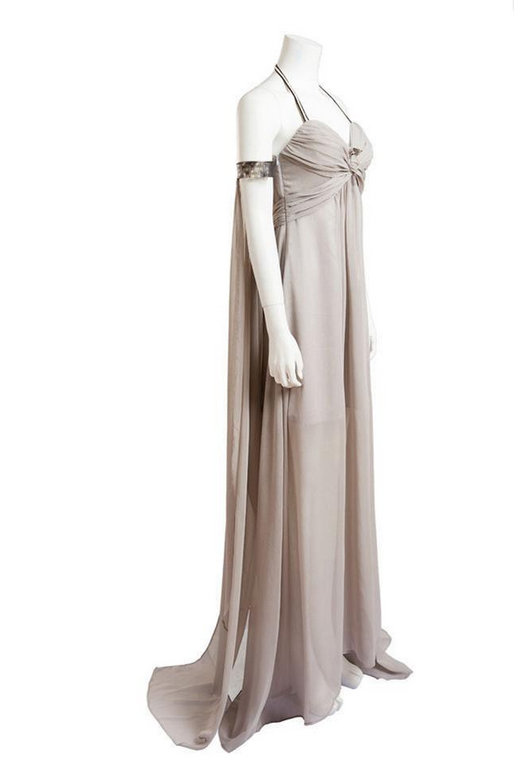 I supposed we only needed to analyze the original gown, but here we need to make a step by step analysis on what the ebay item’s pictures showed. What was I optimistically expecting? back gathered with a non visible seam to the liningat the back. 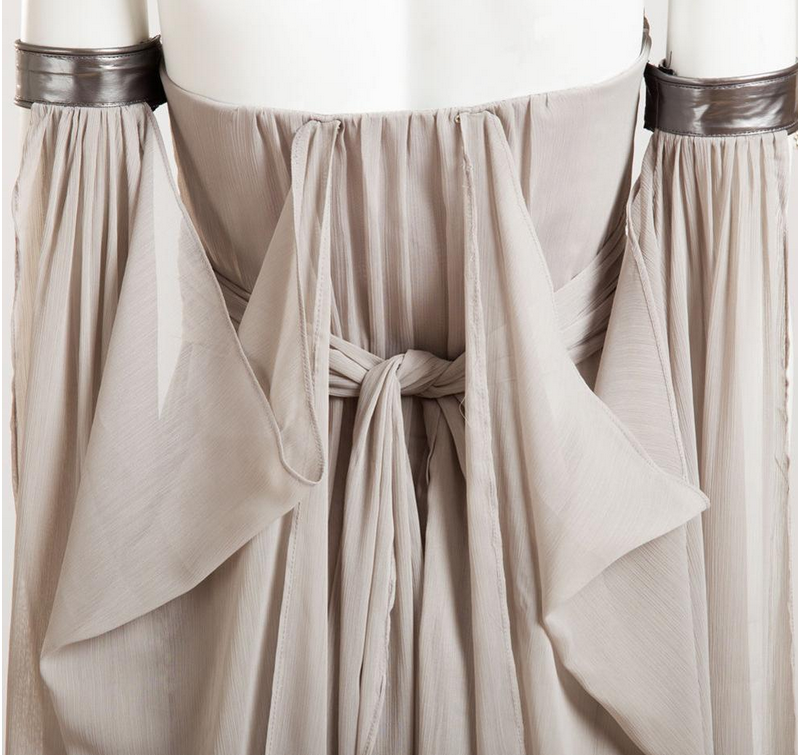 serged hem of the back gathered part visible when worn. What to say…if it had the armbands and neck string done as they promised, and if there wasnt that awful waist seam, I could have worn it. 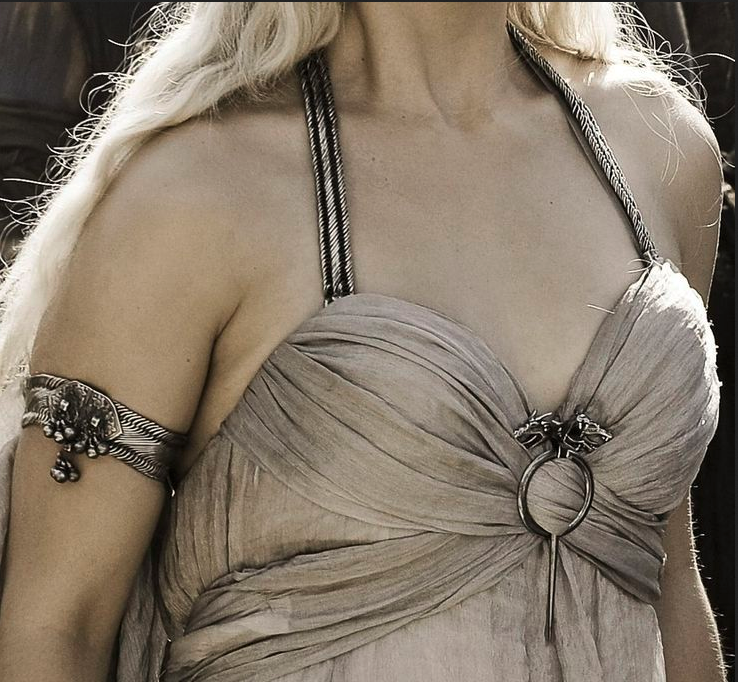 I would have painted the ring, added one of the dragon brooches I had bought the first time I wanted to make this, and I would have tested it. But I think it gows a bit too far to fix it. 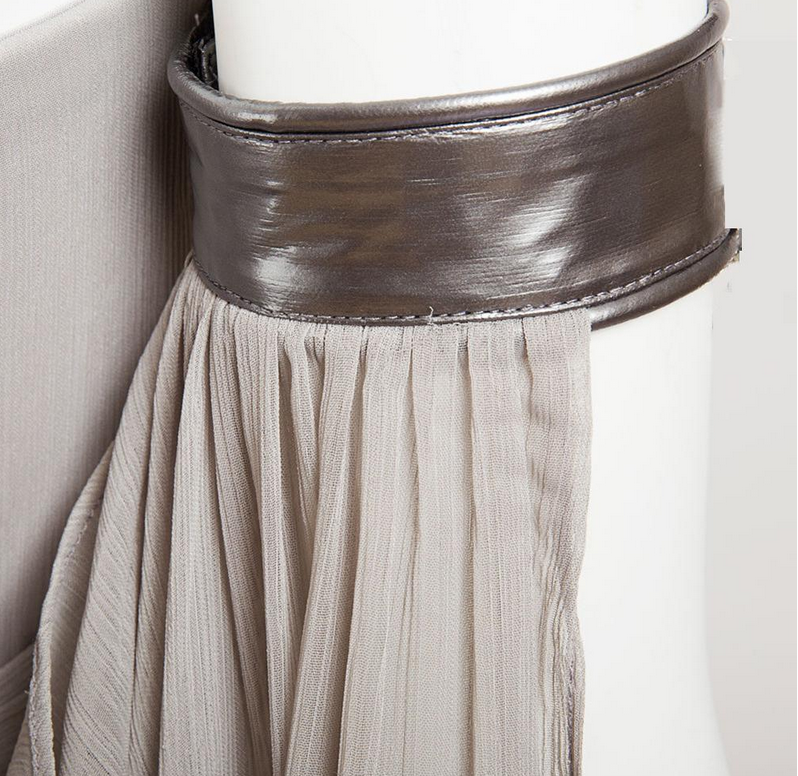 There’s no way to fix that waist seam that should not be there, I can not lift it to hide it under the buckle, because doing so would expose the ankles. 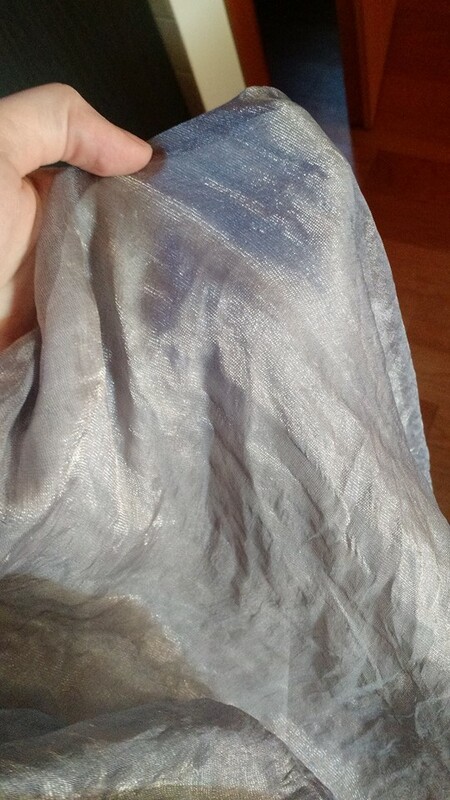 Let’s add to this that the shop owner from ebay didn’t even send me the partial refund I asked for, due to the dress not matching the picture. Because you know, dealing with chinese factories is not like dealing with a real single person that makes her own stuff, and loves what she sells and want to fix it in every way possible if something goes wrong. I got a paypal refund promised, but got none, and there was no way of getting anything back. If I had stopped to this, I would be disappointed, only disappointed. 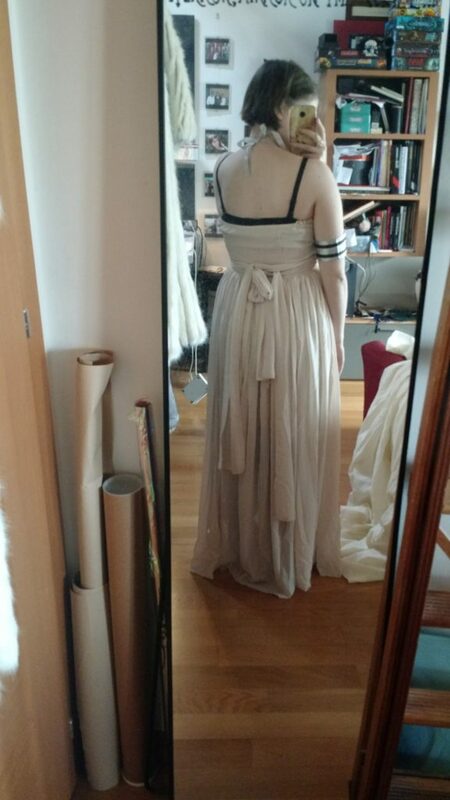 But now I am triggered to go on with the real dress: i know I can do much better (even someone with basic sewing skills could have done better armbands, neck string and would have avoided the waist line). But let’s see how close I can get to the original one. I went on with my dress. 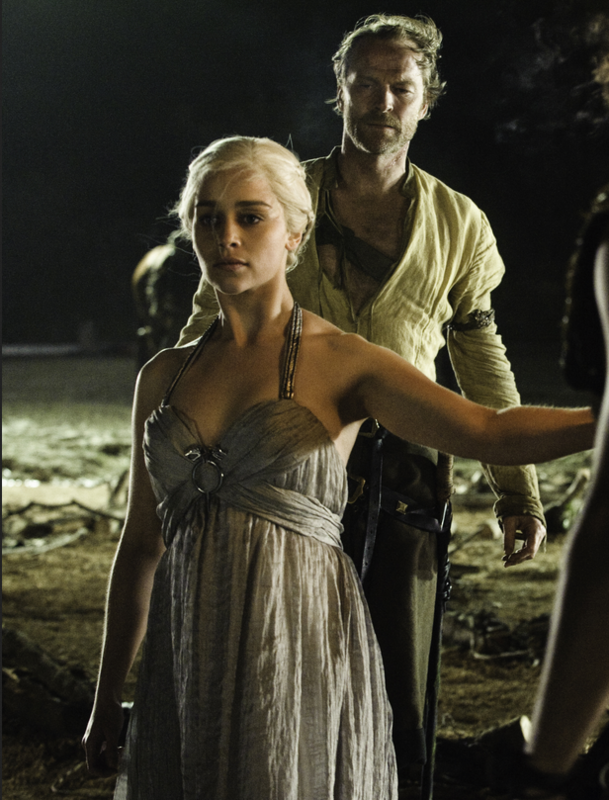 I have to say six meters was perfect for my size (I am a few centimeters taller than Emilia, and a bit larger in the bust). Once you have the width of the original fabric, the cut of the dress looks simply logical, its pattern unfolds to your eyes, and it’s very basic. But it doesn’t work with other fabrics. I started building it on a bra, but in the end I purchased some bigger cups than my size, as I wanted more coverage, as in the original. For the strings, I tried to weave wire, to weave thread and cover it in silver leaf, but in the end the closest option was soldering snake chain. I styled my wig, after ventilating a bit to fix the hairline. 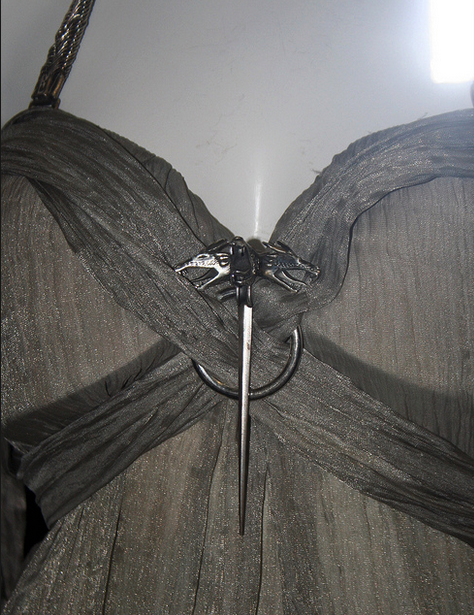 I used adragon brooch I had for some time, and I still have to find the proper ring. I can’t wait to take some pictures with the proper makeup. But let’s do some math. original fabric, 6 meters, 25£ per meter plus VAT, plus 35£ for shipping. It makes 180£+35£. 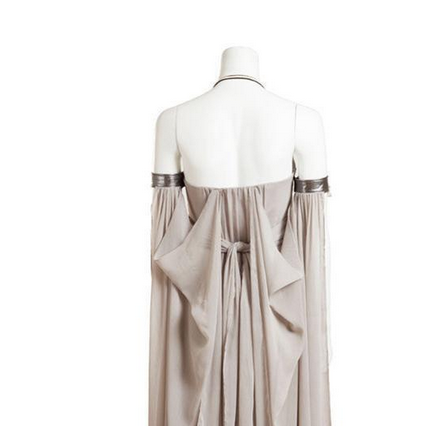 It’s 230 euros for the outer fabric. 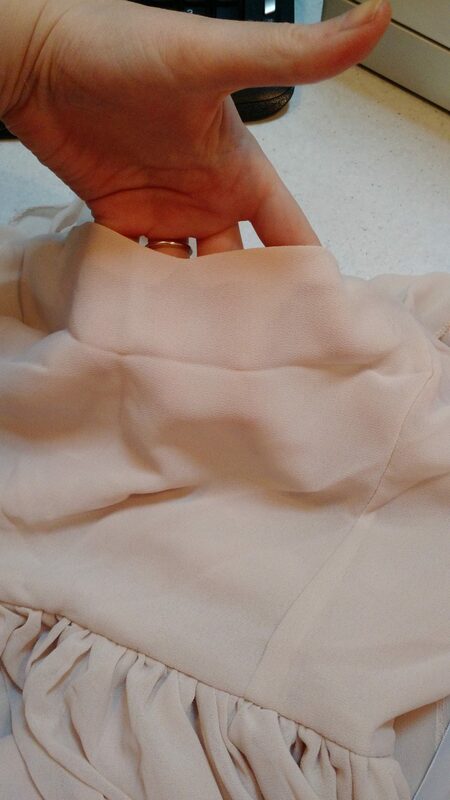 lining, I managed to do with 1,5m of silk chiffon. 12 euros per meter. 18 euros. cups: 13 euros for the bra to cut. snake chain 5m, 8 euros per meter. 40 euros. Total: 346 euros for SUPPLIES ONLY. I am not counting the extra dye for the first wrong dye bath, nor the decoloring powder, whic together make 10 euros. I am not counting the bracelets I purchased to see if they could work as armbands, the other cups (8 euros). I have not included the experiments with wire, silver leaf. These are costs that apply to MY costume only, when I re-make it, I don’t have these costs, but they have to be added to mine. I have not added the electricity for the soldeing iron, or the cost of it. 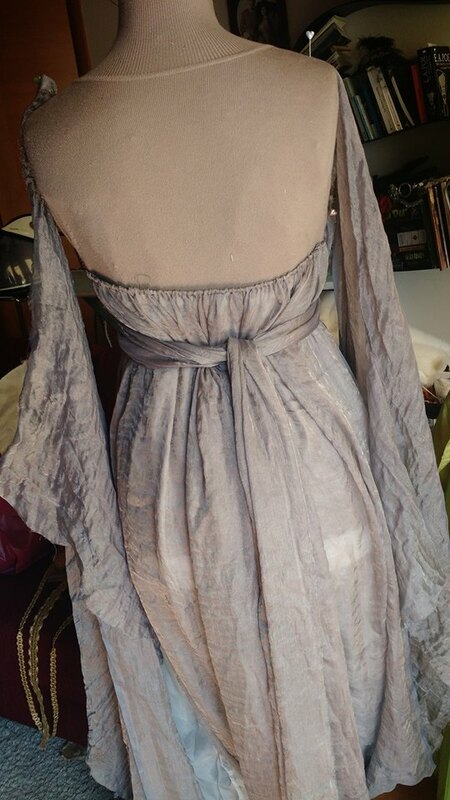 I have not yet added the hours needed for hand sewing the whole dress, for ventilating the hairline of the wig, setting the right waves, styling it, making the filigree rings by hand. 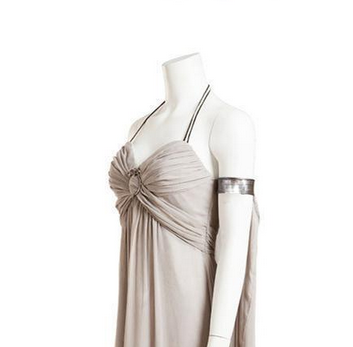 I have not added the indian slippers with silver bullion I’m wearing with this dress. Etsy suggests to at least double the cost of the supplies. So the costume would cost 692 euros. I could argue that counting the hours it takes to make, it would should cost much more. Then there’s the new 5% etsy fee, which gets to more or less 35 euros. It’s 727 euros. And this without counting local taxes. So in the end, even if you make it yourself, you spend more than five times what the ebay one costed. But to me, my result is worth more than five times the final result of the ebay one. I enjoy making it exactly how I want it. Which is why I don’t always count the hourly wage, but I double the supply cost, and do the average among that and the hourly wage, so- besides my costumes not being cheap- I am underpaid because I love what I do. Which I choose to do, but most people don’t get that, they see a huge cost, and they think it’s 20 euros for the supplies, and all the rest in my pockets. In the end I am happy to get slightly underpaid, when the customer really understands the value of what he’s getting, the love behind the work, the passion, and treasures the final piece. That said, if you want this costume for less, there’s Ebay, if you can grow to like that thing, and if you still don’t see the difference, you quite deserve to get the ebay one, I’m sorry.